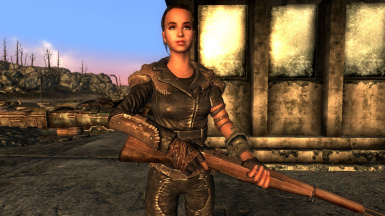 Amata, you and the Wasteland. Now with added sugar and companion quests! ATTENTION! : Support not given to problems solved/dealt with in this section! Reading is a universal skill, use it. 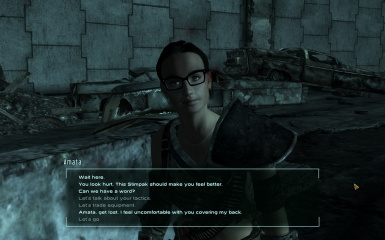 This mod, as you might guess, adds Amata to Fallout 3 as a recruitable follower. If you are wondering why this is called Follower Amata ULTIMATE, it was originally just a working name for a revamp this mod went through in early 2010. It also sounds cool. 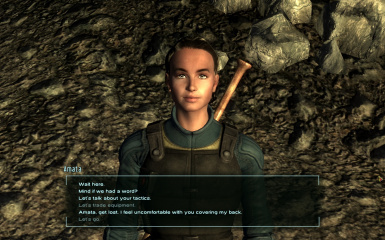 The current version, U2, allows you to recruit Amata in the most lore friendly way possible and have her follow you into the Wasteland and its dangers. New in U2, she now has two brand new fresh cool kitten awesome companion quests, which I will tell about a bit later. So keep on reading, maggot! 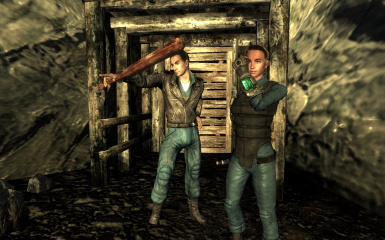 1) Do not kill the Overseer. 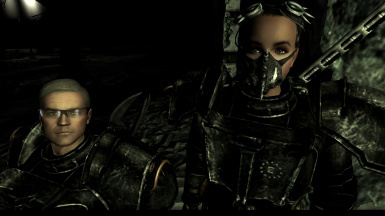 5) Convince her to leave the Vault, and smack those two guards. 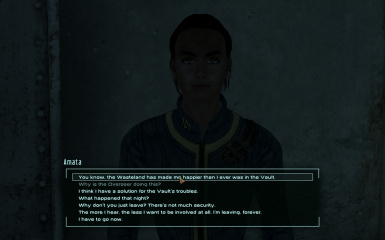 2) Pass the speech checks ("Starts from dialogue: "You know, the Wasteland has made me happier than I ever was in the Vault"). You will need a lot of skill for these, so I recommend boosting your speech to at least 85 before trying. 3) Solve the quest peacefully. 5) Wait for Amata to speak to you. Quest 1: Like I Said! 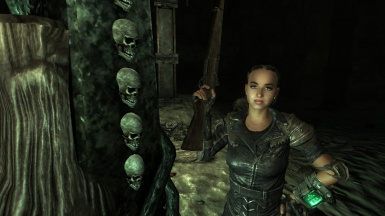 - To prove that accompanying you into the Wasteland, you should take Amata to see some remarkable settlements and locations in the Wasteland. You will need to have escaped Raven Rock to complete this quest. 3. Raven Rock (Need to have escaped Raven Rock). Talk to Amata near the entrance. Quest 2: Aren't You A Tough Lady? None, but I highly recommend FOMM. 3. Start FOMM and place a checkmark beside the .esp file(s). Delete FollowerAmata.esp, any optional related .esps and Follower Amata voice files. and Escape! Example being Project Beauty. you feel like cheating and use console commands. - Fixed Trouble on the Homefront recruitment. - Fixed follower count being set to 1 when recruiting in Escape! 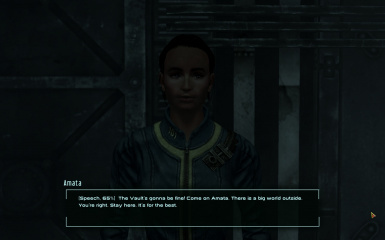 - Added more dialogue for Amata. - Attempts on bug fixing. - Amata now comments if you spare Colonel Autumn in Take it Back! - Refurbished her dialogues a bit. - Looked into alleged "multiple Amatas" bug when spawning her manually. - Added message notifiers for her quests. - You can now set her a home marker, where she will go when fired. - You can now tell her to be more or less aggressive. Ask in the comments section, send me PM or PM me in BGSF forum. My username there is "Pistolero". Same goes for personal tweaking if it's released. I have nothing against tweaking the mod for personal use. And no, you may not upload this file on another website let alone claim you did it.